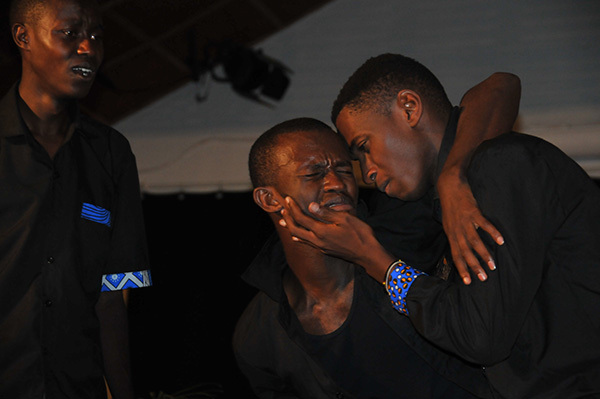 Romeo [Eric Shema] cradles Mercutio's [Innocent Munyeshuri] face after he is mortally wounded by Tybalt. Benvolio [Clovis Shyka], left, looks on in grief. Rwanda, as we have been reminded in the press recently, was the site of a devastating genocide in which as many as a million Tutsis and moderate Hutus were murdered by Hutu militias in 1994. The slaughter of nearly a million in a hundred days was the fastest genocide in recorded history — the culmination of generations of tensions between the two groups imposed by the racial fictions devised by colonial powers for organization and control. We were there as co-directors with Youth Bridge Global, a nonprofit organization committed to providing artistic and educational opportunities for youth in under-resourced and challenged parts of the world. Our decision to bring Romeo and Juliet to Rwanda was carefully planned and deliberate. Shortly before the 2010 Dartmouth Commencement, in a serendipitous meeting at a dinner honoring Dartmouth retirees and recipients of honorary doctorates, Andrew Garrod met Dr. Agnes Binawaho, the Rwandan Minister of Health. As they became acquainted, Garrod explained that his greatest interest was to produce Shakespeare with youth from the disparate groups in former war zones and sites of genocide. Dr. Binawaho urged him to come to Rwanda. “And the play you must put on is, of course, Romeo and Juliet.” And so was born the choice for Youth Bridge Global’s next big project that would take two Dartmouth professors and two Dartmouth alums joined by four undergraduates and graduates from other Canadian and American universities to Central Africa in the summer of 2013. The story of Romeo and Juliet and their families who are reconciled from a long history of mutual hatred after the needless, tragic deaths of the youths, can be viewed as a theatrical metaphor for the events of the 1994 ethnic cleansing. Shakespeare’s tragic masterpiece, with its exploration of headstrong love, bravado, impetuosity, passion and senseless violence clearly had resonance for our young Rwandan actors and their recent history. The folly of savagery and slaughter was all too familiar to them. They welcomed participating in a play whose chief events mirrored some of those in their country’s past and they relished Romeo and Juliet being performed in three languages — 60 percent Kinyarwandan (the local language), 20 percent French, and 20 percent in Shakespeare’s iambic pentameter. The story was transferred to a Rwandan context with local costumes and Rwandan imagery in the set construction and Rwandan music on the inanga played by Daniel Ngarukiye. Despite the enthusiasm for the project expressed by the young cast — led by Mouhamad Nshimiyimana, Eric Shema, Tete Divine, Clovis Shyka, Innocent Munyeshuri, Abdoul Mujyambere, Jeanine Uwase, Diane Mushimiyimana, Fabrice Ndayisenga and Peter Nambajimana — Youth Bridge Global and Isyho Arts Center, the Rwandan nonprofit hosting us, were treading on unexplored artistic terrain. 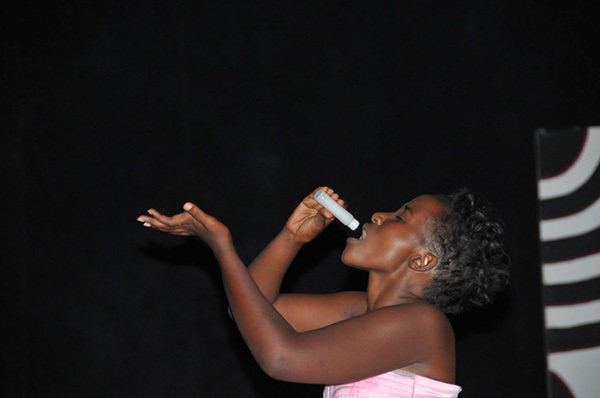 We were told that Romeo and Juliet had never been performed in Rwanda prior to our production. The cast of 32 had been recruited from a pool of over 60 auditioners skillfully recruited by Carole Karamera, our producer, and had a median age of 21. The task of producing such a demanding play presented the team with many daunting challenges. Most of the participants were inexperienced in acting and stagecraft. The decision to make the play a trilingual presentation increased the reach of the performance in a country with many languages, but also presented the directing team with formidable challenges, given the varying skill of the actors in the three different languages. Then there was framing the play in an African context with none of the directing team other than the producer being African. Combined with logistical challenges such as the need to feed and transport the cast daily from the far ends of Kigali to and from the rehearsal site, these obstacles were formidable. What truly made the difference was the passion and the enthusiasm of the Rwandan actors themselves — their belief, shared by the directing team, in the power of theater to unite different groups upon a common ground of emotion, revelation and understanding. Juliet (Tete Devine) drinks the potion that will give her the appearance of death. Why did the young actors want to be part of this international production? Clovis, who played the peacemaker Benvolio, was attracted by the production’s stated aim of furthering the healing process. “I wanted to help express or give the message I had in me — to show people how good reconciling is.” For some, like Eric who played Romeo, what engaged them was the thrill of being “connected to everybody in the circle.” Others stated that they were looking to make new friends, develop their language skills and perhaps — even for a few hours — forget their tragic pasts. Not a single actor with whom we spoke was without grave loss and suffering from the genocide. One stagehand had lost all nine siblings and his father; for Tete Divine, our Juliet, it was her father and multiple siblings. Every life seemed touched with tragedy. While not all of the seven performances in four locations drew large crowds, the play always was performed with urgency and conviction, and invariably delighted its audiences. Our Rwandan audiences were very participatory in a way that evoked the atmosphere of an Elizabethan performance — in some instances some in the audience meandered below the stage jockeying for a better view; there was a constant chatter and banter among audience members in response to the events of the play. Often they spoke directly to the players. “You lucky guy,” shouted one male in the audience on opening night as Act III, Scene V opened, revealing the bare-chested Romeo embracing Juliet on the marriage bed. The actors performed with fierce concentration and commitment. Each audience was different and the actors learned what it means to adjust to the demands of playing in different spaces with different audience responses. Many of the actors came to establish a bond with their fellow players on the stage; many left each performance also with strengthened ties to the community. An artistic choice that profoundly moved many audiences was the decision at the end of the play to have members of the Montague families embrace the Capulets, and vice-versa, and to have those who “died” in the play appear onstage in this circle of valedictory love. The audience applauded rapturously as the characters hugged each other. Will the experience really profoundly change the perspectives of our actors? We cannot know. How as Westerners do we presume to approach the notion of reconciliation— with actual victims — through the lens of Romeo and Juliet ? Our strategy was to concentrate on the text, on the play, and to encourage actors to use their personal experiences to fuel and voice the experience of their characters. As co-directors, on a daily basis we worked together on drama exercises, theater games, improvisations and blocking scenes. So short was the rehearsal period — we generally worked six hours a day — that often we had to work separately with different actors in different venues to make progress. Our “official” duties, while intense, still allowed us time to build friendships with the Rwandan actors and to deepen our mutual trust. We took away an immense respect for the resilience of the people in a country that now seems full of hope and promise — even if the reconciliation process proves to be arduous. The new generation of Rwandans, as populated by our cast and crew, is excited to create possibility and opportunity for expression through teaching, healing and the arts. Rwanda is a country that desperately needs that healing as it struggles to look beyond the immeasurable pain and loss of its recent history. Andrew G arrod is professor emeritus of education at Dartmouth College and co-director of Youth Bridge Global. James G. Rice is professor of theater at Dartmouth College.